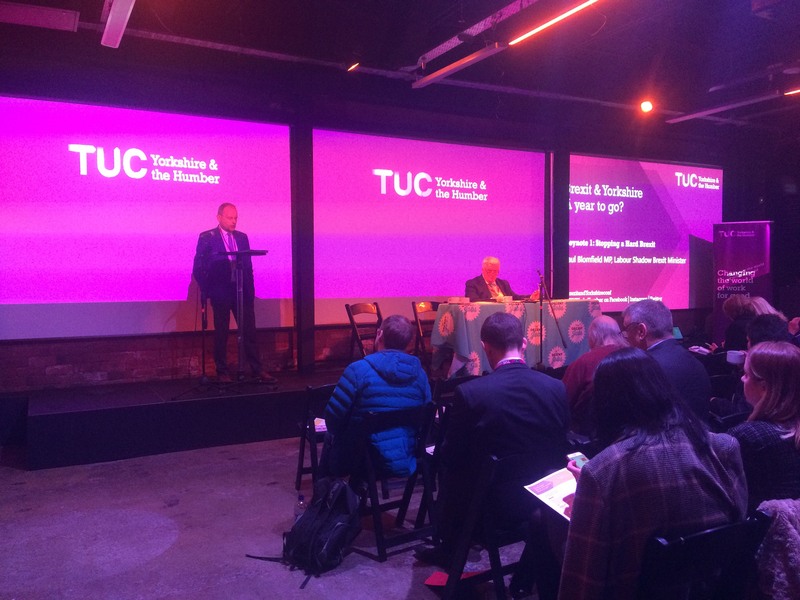 On Friday 13th April, I spoke in Leeds at the TUC’s conference, ‘Brexit and Yorkshire: A year to go?’ on ‘Stopping a Hard Brexit’, pointing out that the Government has spent over a year negotiating our departure, the part that they said would be the ‘easy bit’. The divorce bill has been settled and significant progress has been made on citizens’ rights, although some outstanding issues remain. But the big issue yet to be resolved is Northern Ireland. And, with 22 months since the vote and six months left before the deal needs to be finalised, we are just now beginning to discuss the difficult bit; the future relationship between the UK and the EU. The challenge has not been so much negotiations with the EU27, but negotiations within the Conservative Party. Failure to resolve their internal differences has created paralysis in Parliament. The Government are holding back the Trade Bill and Customs Bill, fearing defeat and have yet to present bills for immigration, fisheries or agriculture, fearful of the hard truths they will have to present. The most important negotiations in our lifetime, are being held back by the most dysfunctional Government in living memory. Labour offers a fundamentally different approach. We respect that people voted to leave but we do not accept that they voted to lose out. So, rather than a Brexit led by red lines, we have been pushing for one that prioritises jobs and the economy; a Brexit that protects rights established over 45 years of EU membership. Securing a transitional period was key to this, to prevent a cliff edge in March, before our new relationship was formulated. We argued for a transitional period based on the existing arrangements and, after initial resistance, the Government finally caught up with us in the Prime Minister’s Florence speech. But we need a clear vision for the future relationship. We must recall that the Government’s own analysis in the impact assessments – which we succeeded in making them release – set it out in black and white: the more distant our relationship with the EU, the more damage to our economy. It estimated a hit to Yorkshire and Humber of up to 7% if we were to follow the most ardent Brexiteers and crash out without a deal. So, Jeremy Corbyn set out in February what we would be seeking: a comprehensive customs union with the EU and the closest possible relationship with the Single Market, as well as maintaining membership of agencies and partnerships. This will secure our relationship with our closest trading partner and protect the manufacturing base, so critical to our economy in Yorkshire. We have two main points in the months ahead – the return of the EU (Withdrawal) Bill in May and the meaningful vote on the ‘Brexit deal’ in October. Does it ensure a strong and collaborative future relationship with the EU? Does it deliver the “exact same benefits” as we currently have as members of the Single Market and Customs Union? Does it ensure the fair management of migration in the interests of the economy and communities? Does it defend rights and protections and prevent a race to the bottom? Does it protect national security and our capacity to tackle cross-border crime? Does it deliver for all regions and nations of the UK? If, at the outset, the Prime Minister had said that the referendum was a close vote – to leave, but not rupture our relationship with the EU, she would have received overwhelmingly support in the House of Commons and across the country. Instead, she has allowed her agenda for a decision that will determine our place in the world for decades to come to be dictated by the right-wing ideologues of the European Research Group, two of whose former chairs – Steve Baker and Suella Fernandes -; are now among her Brexit Ministers. Labour’s approach is to protect the livelihoods of people across this country. Time is running out for this Government to wake up and do the same.